Getting There: Access to the park is via Nanga Rd, which runs off Pinjarra-Williams Rd near Dwellingup. Turn off is 12 kilometres down the road from the start of Nanga Rd. 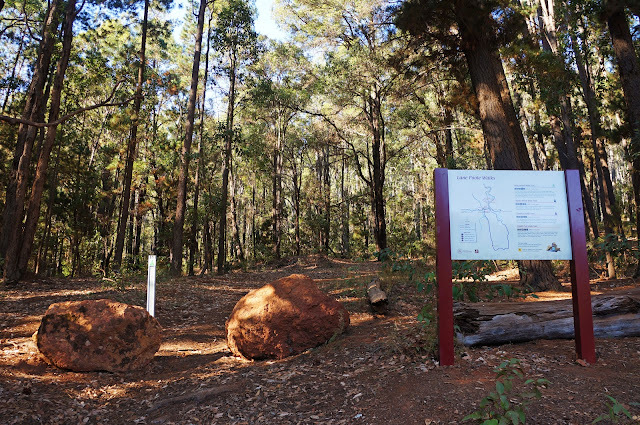 The trailhead is located in the Nanga Mill area of the park - do not enter first entry station to Lane Poole Reserve, instead continue across bridge until you reach the Nanga Mill sign. Back in the walk trail information dark ages of 2010, finding out about walk trails beyond TrailsWA's Top Trails was a fairly challenging prospect. It involved a lot of time spent scouring the internet for craps of often outdated information from local shire and town websites or pestering local DEC offices by email. 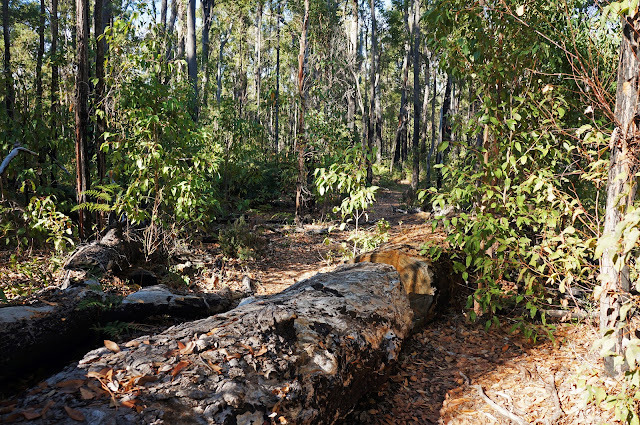 Having persevered with this task, the King Jarrah Track in Lane Poole Reserve piqued my interest due to its decent length - a rarity for loop walks in Western Australia. Setting off with a friend to check it out, we were disappointed to find the trailhead difficult to locate at the time and ended up leaving without tackling the trail. Five years later and with trail information increasingly more accessible, Alissa and I had intended to do the King Jarrah Track in late 2015 or early 2016, however the Waroona Fires put a quick end to those plans. 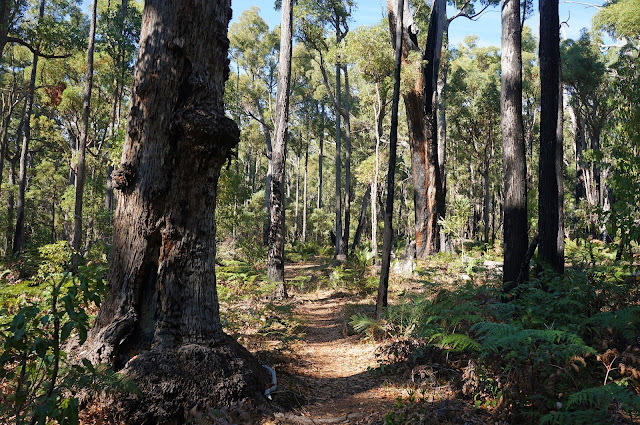 So when I saw that the King Jarrah Track had been reopened in April 2017, I was pretty keen to finally tick this walk off my list - almost seven years after I first heard of it! The trailhead was fairly easy to locate, and provided all the relevant information we would need. 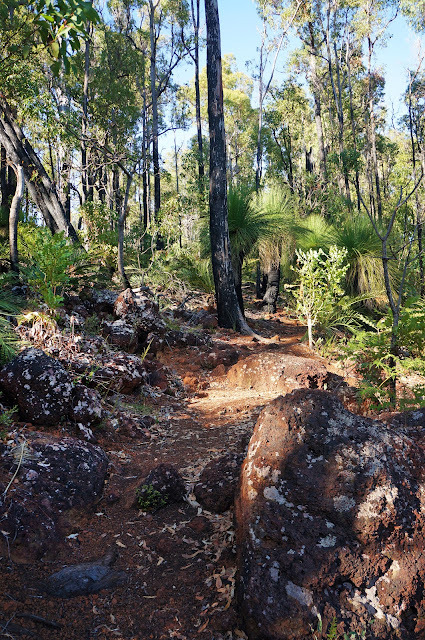 Described as 'moderately strenuous' and rated as a Class 4 walk, the trail immediately rises steeply from the trailhead and up the hill immediately south. This definitely gets the heart rate up right out of the gate, however it will be comforting to know that this is really the hardest part of the whole walk, with only one other sustained long incline to negotiate further along the track. While steep, the ascent is at least short and sharp, and before long Alissa and I were enjoying flat and fairly easy walking along single file track through lovely Jarrah forest. Compared to Wandoo, Karri and Tingle forests, Jarrah's rough bark, grey colouring and often stunted appearance can make for somewhat dull and uninspiring walking, however the Dwellingup area generally seems to have a lushness to it that makes for good walking. The single file walk trail makes the trail fairly easy to follow for the most part, with clear markers providing clear navigational information where the trail crosses the odd vehicle track or two. About an hour into the walk, Alissa and I passed a tree that other hikers had started a tradition of putting rocks on top of. We're not sure how this began or why it has been done, however Alissa decided to oblige the tradition by adding another rock to the tree's pile. Other than the rock-covered tree, the first hour of the track was fairly straightforward walking through lush Jarrah forest. Although uncomplicated, the walking was nevertheless engaging, enjoyable and very pleasant. 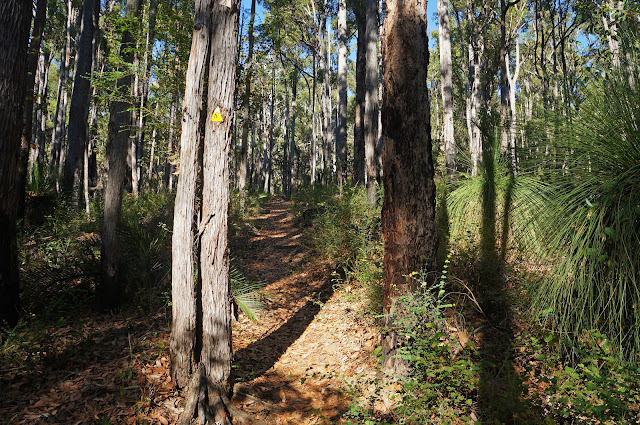 Although I'm sure most of the forests in the Lane Poole Reserve area were logged in the 20th Century or significantly burnt by the devastating bushfires of 1961 that claimed the township of Nanga Brook, Alissa and I were pleasantly surprised to see some fairly large and mature Jarrah trees scattered through the forest. 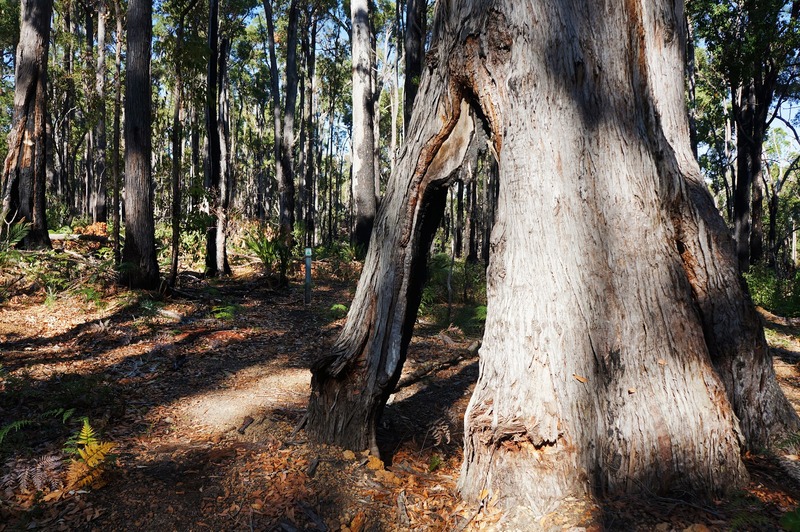 One such example, with its buttressed base and large size, had a similar appearance to the Tingle Trees of the Valley of the Giants in Walpole-Nornalup National Park. 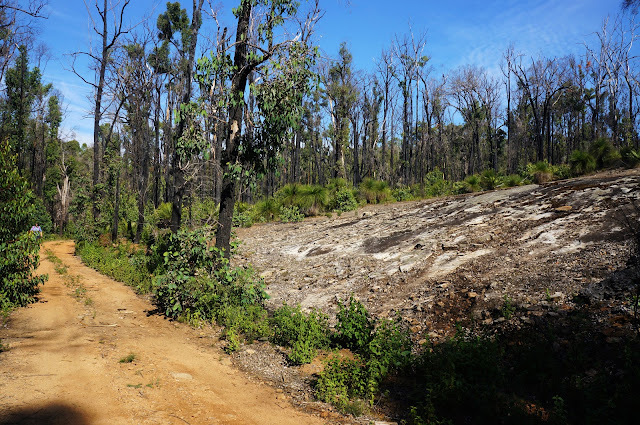 A mere five minutes after leaving the buttressed tree, Alissa and I entered an area of forest significantly burnt by the Waroona fires. 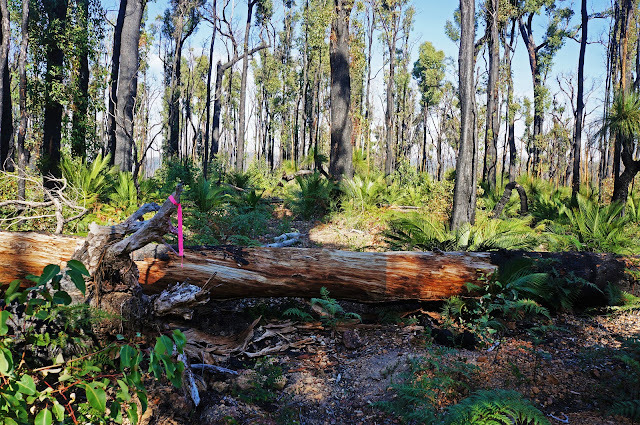 Although the fire had been devastating, the resilience of the Jarrah forest was on full display and reminded Alissa and I of the way the recovering forest near Mt Dale looked not long after it was also burnt by bushfires two years ago. Along this burnt section, the track descends to a small creek and then ascends steeply up the other side. This is the other major ascent of the walk - once you've reached the crest of the hill, there is very little ascending to do from there to the track's end. The walk was not without its challenges however, as an area of fallen trees made navigation a bit confusing, and it is obvious that the track maintenance workers had not yet gotten around to clearing the trees and marking the area properly. 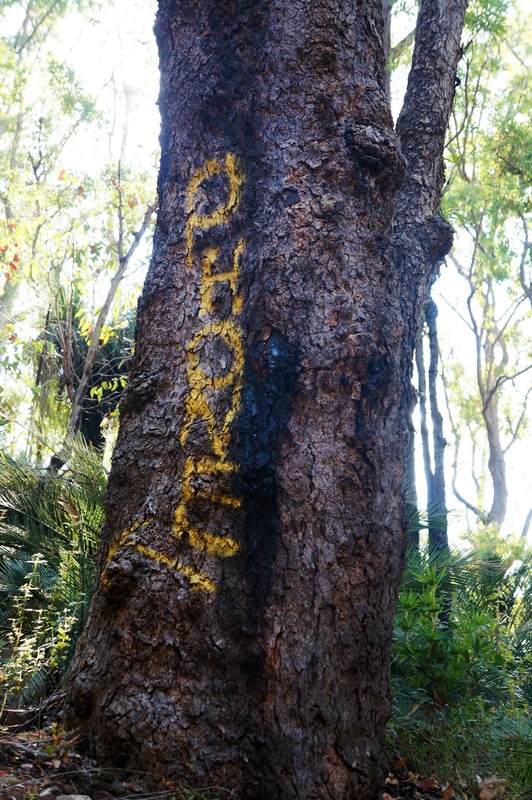 That being said, it was obvious that they (or another hiker passing through) had noticed the problem and marked the area with pink flag tape. Following the flag tape was straightforward enough once we knew to look for it, and I imagine that in time new markers will be in place to make this just as easy to follow as the rest of the way. 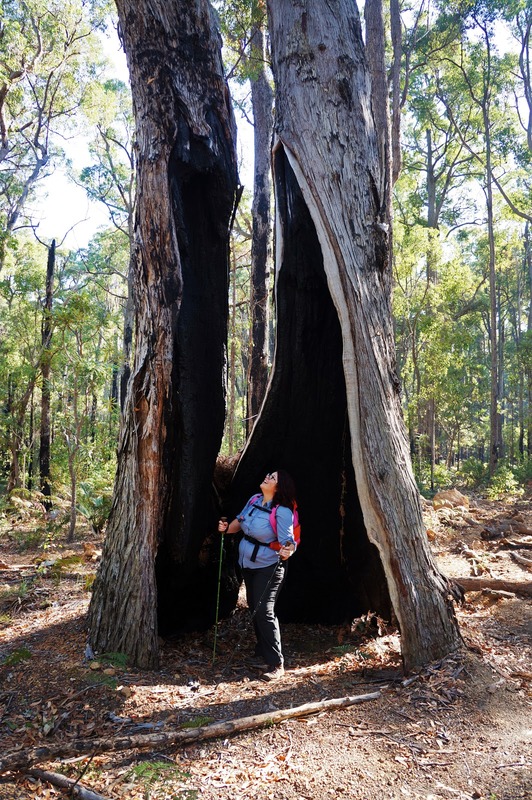 About two hours into the walk, Alissa and I reached the trail's namesake - the King Jarrah. 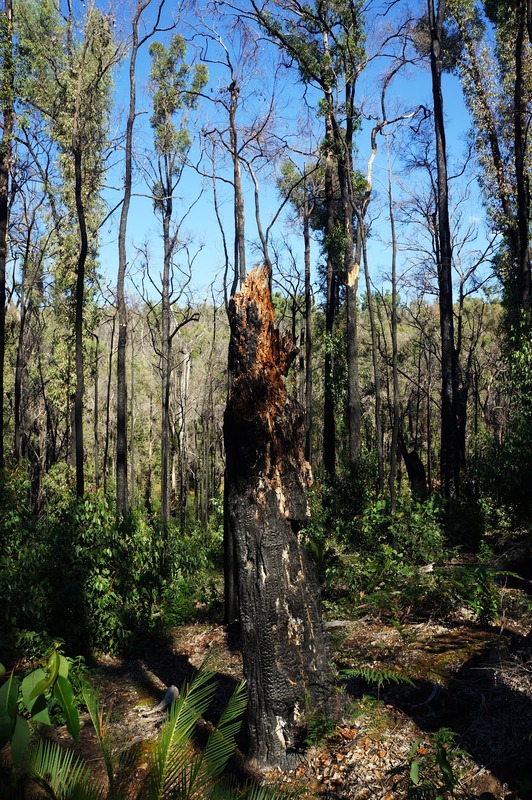 A massive old tree, the King Jarrah has been blackened by the Waroona Fires but has stubbornly survived and in time will hopefully return to its former glory. Interestingly, there is another tree also called King Jarrah located in Lane Poole Reserve. The other King Jarrah is possibly even larger and more impressive, however the forest around it had recently been cleared, creating a rather bleak and desolate landscape that is far worse that the burnt forest in this part of the park. From the King Jarrah, the trail descends steeply before crossing over a creek on a wooden bridge. Given the dry April and early May of 2017, I was pleasantly surprised to find water was already flowing along the creek in mid-May. 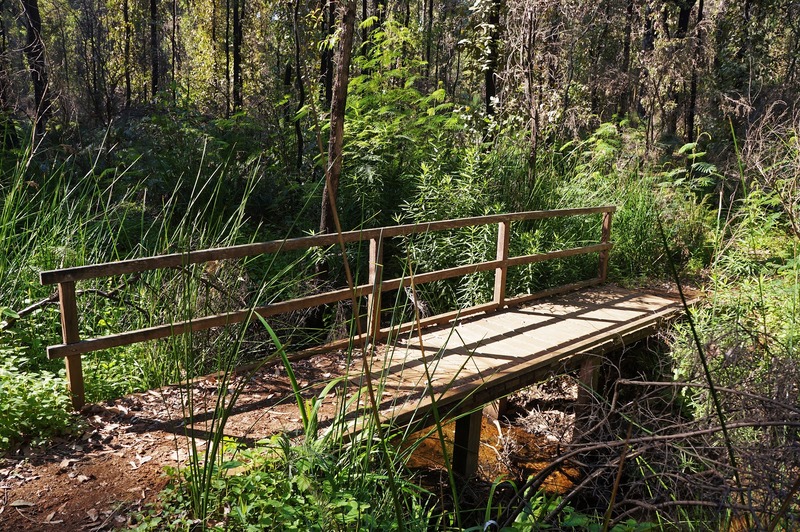 Not long after crossing the bridge, the King Jarrah Track leaves the single file walking trail that had dominated the first seven kilometres and turns onto an old unsealed four wheel drive track for the rest of the walk's eleven kilometres. This four wheel drive track is shared with the Munda Biddi. I have mixed feeling about this section; at times the wider track allows you to see the forest in a more uncluttered light, however the fact more than 60% of the walk is along this vehicle track is not really ideal as it starts to get a bit monotonous after a while. 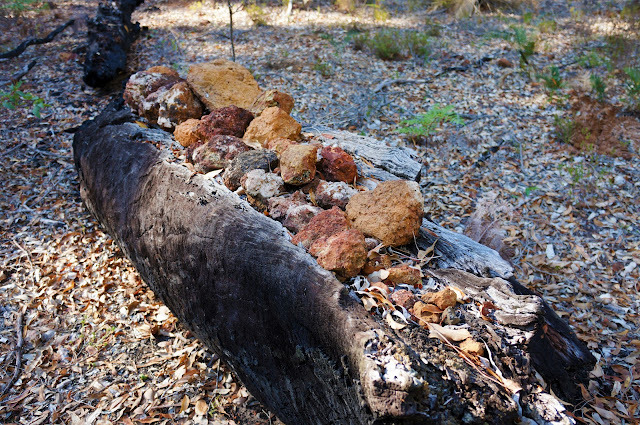 If I were to do this walk again, I would probably drive out to where the King Jarrah Track joins the Munda Biddi and leave bikes there. That way, Alissa and I could walk the first section along the single file walk trail and transfer to bicycles for the return journey back to the car. This would give us the best of both worlds and make this an even more enjoyable trail. The track mainly stayed in the forest, however there were a lot of sights of merit just off the track. 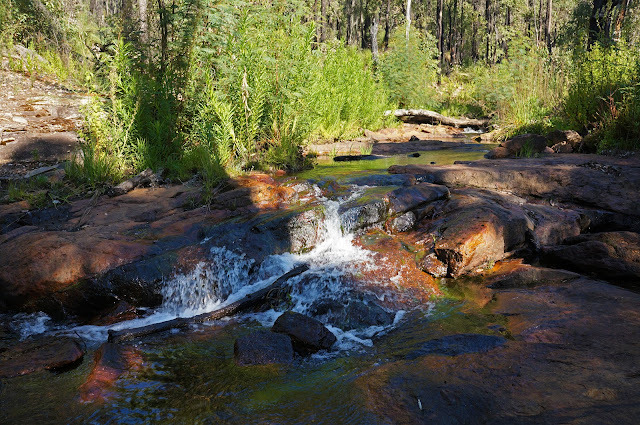 Descending to the left of the trail, I discovered a beautiful series of rapids in a nice shady spot. Further along, we passed a large granite expanse in a section of badly burnt Jarrah. 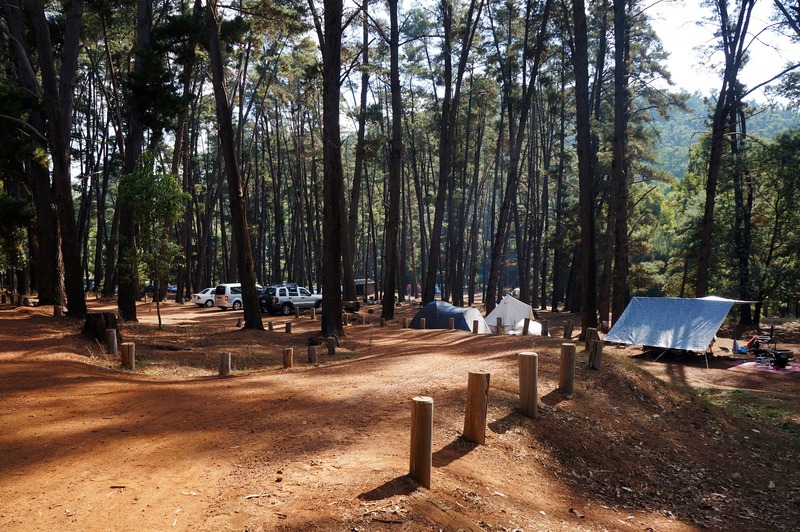 Near the granite expanse, the track runs fairly close to the Murray River, eventually leading to a camping area right on the river. The view across the river was magnificent, with the still water providing a mirror-like reflection of the forest and sky. 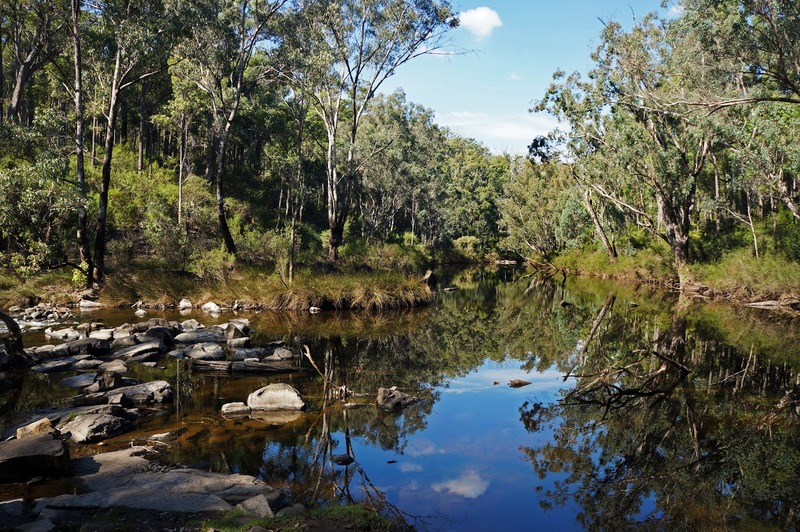 I can imagine that this would be even more spectacular at sunrise and sunset - I can see why Lane Poole Reserve is so popular as a camping and kayaking spot, and would love to come back for a paddle some time in the future. 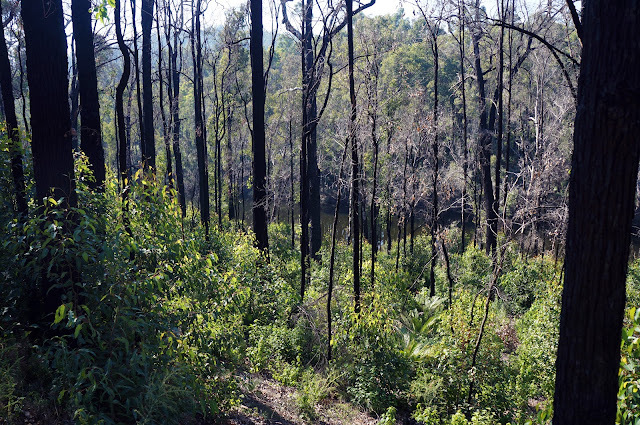 Beyond the campsite, the track runs through areas of forest that were not burnt by the Waroona fires. 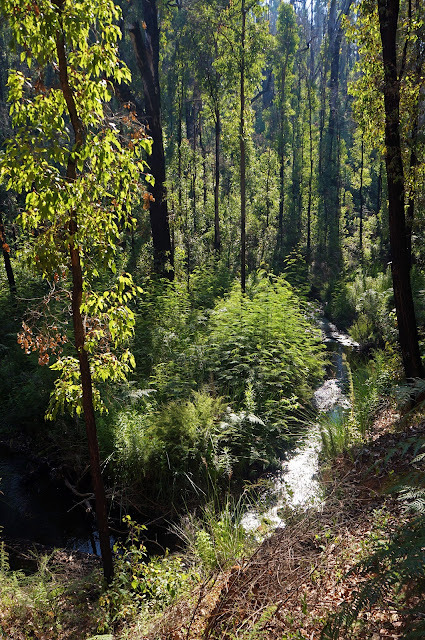 The forest here is quite beautiful, with the many taller trees preventing the area from having the scrappy appearance common to the Jarrah forests nearer to Perth. About 20 minutes from the end, Alissa and I were intrigued by the painted message on the tree above. It was unclear whether this was graffiti or a makeshift sign, but we thought the idea of a phone hidden deep in the forest to be highly amusing. If there was a phone up there, it would make for quite the treasure hunt! Beyond a gate along the vehicle track, Alissa and I reached the campsite at Nanga Mill. This fantastic camping spot surrounded by pine trees is extremely popular, with families, school groups and even some very happy dogs all out and about enjoying nature. 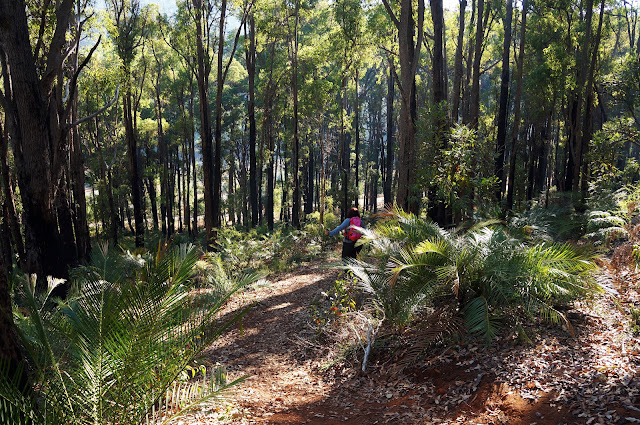 From here it was a few hundred metres to our car and the completion of the King Jarrah Track. When we reached the end, Alissa and I realised we'd motored through the last 12 kilometres in excellent time, walking at an average pace somewhere between 5.5 and 6 kilometres. 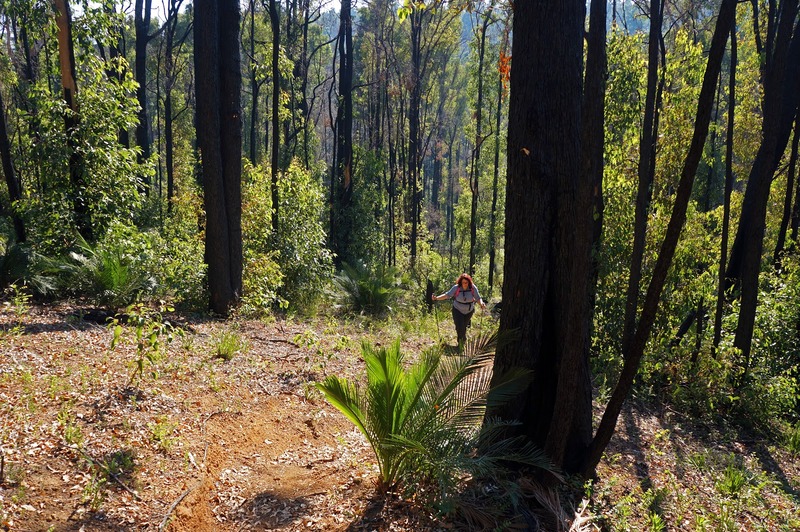 Overall, I was happy to have finally completed the King Jarrah Track - it only took me seven years to finally get around to it! 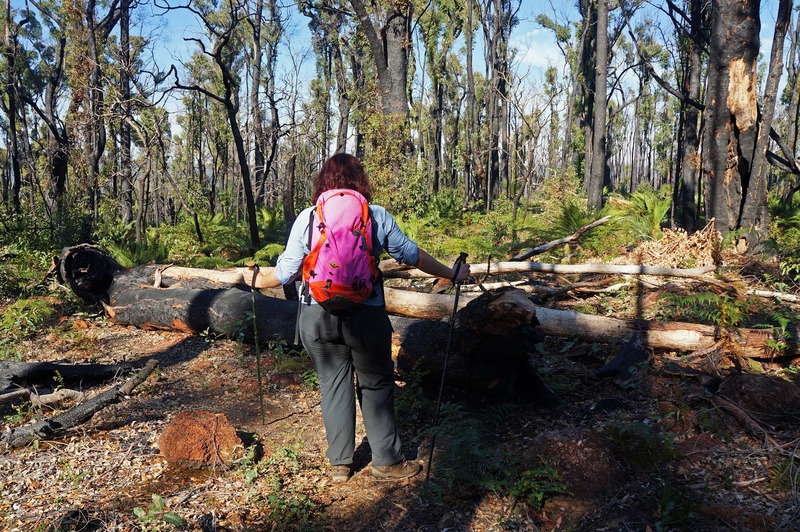 The first seven kilometres along the walking track leading to the King Jarrah were particularly fantastic, even with the sections burnt by the Waroona Fires. The eleven kilometres along the vehicle track were less impressive, but still featured some lovely views, especially at the campsite overlooking the Murray River. 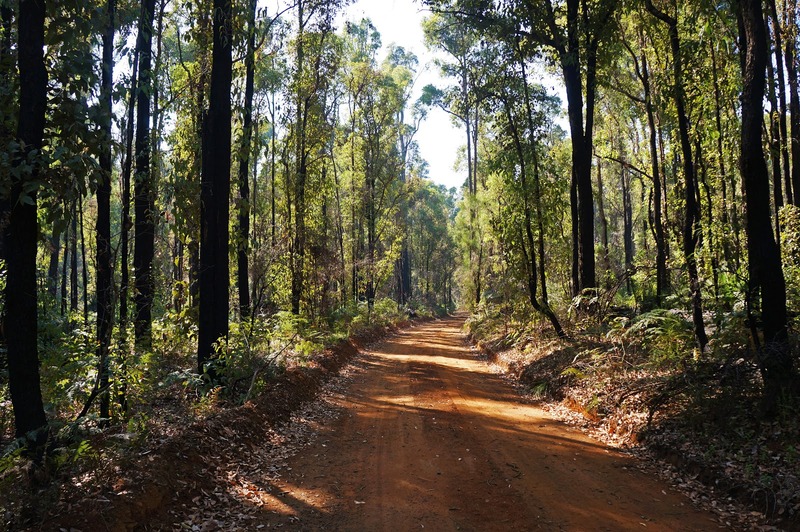 Although I have a preference for longer trails, the section along the vehicle track was a bit too long and too much of the same to ultimately maintain interest, and I would recommend cycling this leg since it runs along the Munda Biddi. 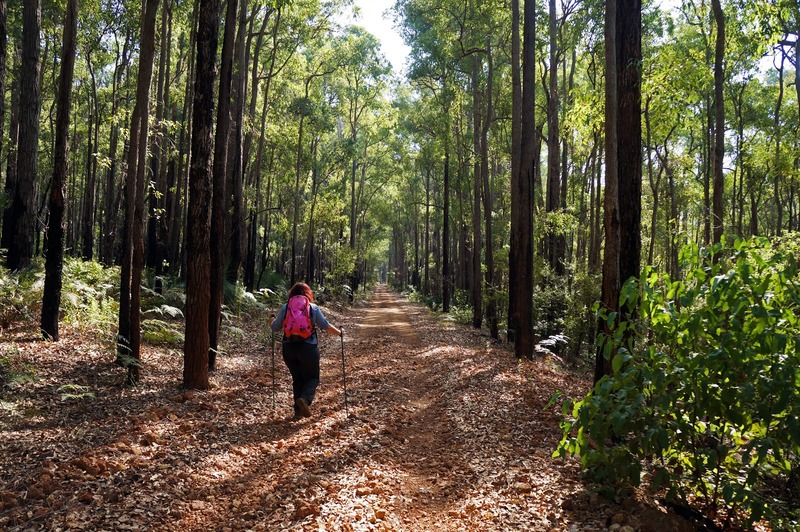 By doing it as a combination walk and cycle trail, the King Jarrah Track would be a really fantastic trail, and I would definitely do it that way the next time.